Dial-by-Name Directory enables your callers to find extensions in your system by last name when they press the extension number of your Directory when calls are answered by the auto-receptionist. You can change how the extensions are searched, either by first name or last name, configure the list of extensions included, and change the extension number of the directory. Follow the steps below to learn how. Log in as an Administrator to your AT&T Office@Hand account. On the Admin Portal page, click Phone System. Click Auto-Receptionist > Dial-by-Name Directory. Enable or disable the Dial-by-Name directory – Toggle the button ON or OFF on this section to enable or disable the Dial-by-Name directory feature, depending on your preference. 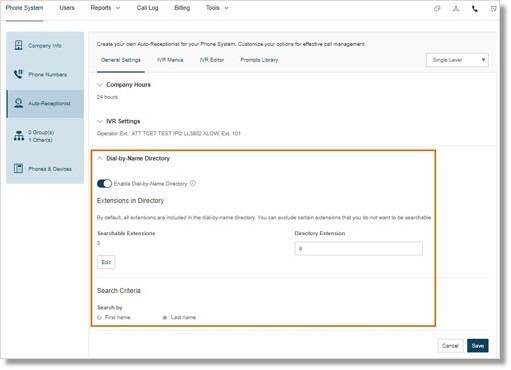 Select the extensions you want to include in the Dial-by-Name directory – By default, all of the extensions and departments are included in the Dial-by-Name directory list. To edit the list, click Edit under Searchable Extensions. Select the Extension(s) that you want to include in the directory by ticking the check box beside the Name. Click Done. Note: You can also type in the Search box and select from the list of Departments to locate the Extension. Click Show All to see all your Extensions or Show Selected to see also the selected Extensions. Change the Directory Extension number – The default extension for the dial-by-name directory is 9. Enter your preferred your extension number in the Directory Extension field. Change how extensions are searched – You can either set the extensions to be searched by first name or last name on the Dial-by-Name directory. Click on the radio button under Search Criteria.